The Big Picture: Director & Boards magazine tracks new director appointments quarterly. 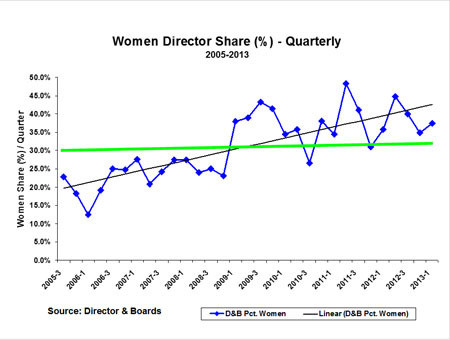 They reported a 37% share for women (red line in the chart below) among all new director appointments in the January-March 2013 period. 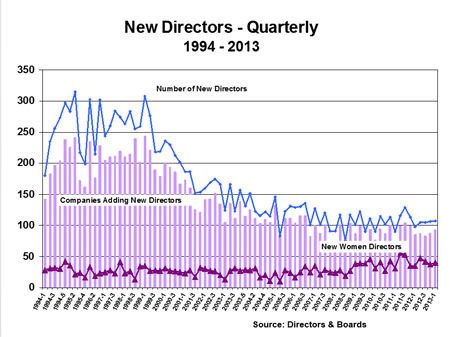 The History: The dramatic downward trend in total number of board seats is clear, beginning at the turn of the century, both for the total number of new directors and the number of companies adding new directors. Let us focus only on the period since mid-2005, as shown in the section marked by the red box, below. The number of firms adding directors has flat-lined in the past several years. The total headcount of new directors added has declined from 2004 to 2008 and has remained steady since then. 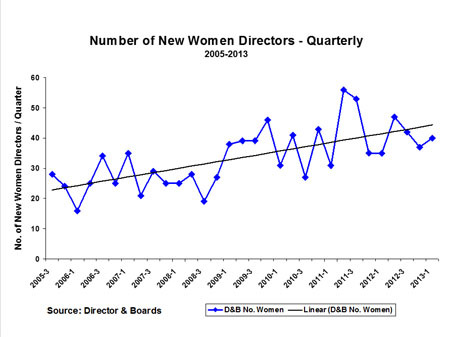 Women Directors: The number of new women director appointments, however, has increased from an average of 20 per quarter in the mid-2000s to about twice that level in the last half of 2012. There is a clear upward trend in stark contrast to board, businesses, and of course male appointments over that same period. 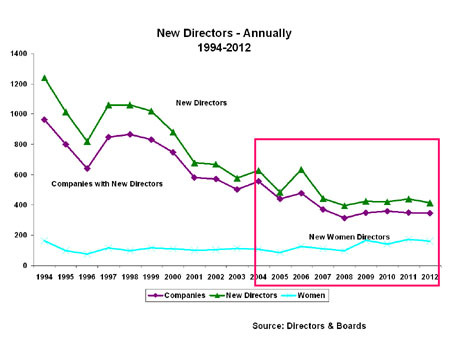 Not only has the headcount of new women directors increased, but that "magic number" (the percentage of women as a share of total director appointments) has increased from an average of 20% to over 35% of new board appointments. 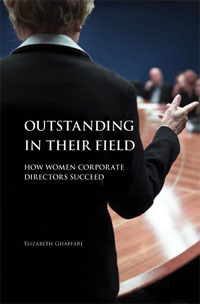 In sixteen of the past 17 quarters, over 30% of all appointed directors have been women. Therefore, any women's nonprofit groups advocating 20 or 30 percent will need to raise their expectations because women already are beginning to hit those goals. Where Are the Businesses? An item of major concern is what's happening to American businesses. Domestic US listed businesses have declined from a peak of 8,851 firms in 1997 to 4,102 in 2012 according to the World Bank. 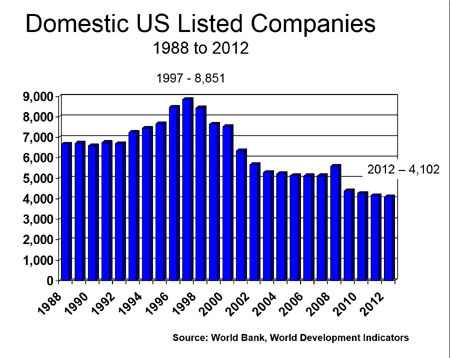 We have cut the number of US domestic listed companies by more than one half in the past 15 years. If the average listed company has a board size of 10, that means about 47,500 directors were no longer needed. At 15%, that meant that 7,124 women director candidates lost their opportunity to serve. That's nothing compared to the decimation of the financial sector. 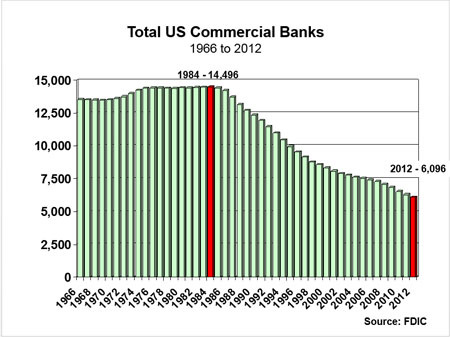 According to data from the Federal Deposit Insurance Corporation, the total number of commercial banks has declined continually since 1984, from a peak of 14,496 banks to only 6,096 in 2012. That meant the elimination of 8,400 banks or 84,000 directors (assuming an average of 10 per bank) and 12,600 women directors (assuming only 15%). The same phenomenon has happened with federal and state credit unions. The total number of federal credit unions dropped from a peak in 1970 of 12.977 to a low in 2011 of 4,589 (a drop of 8,688). 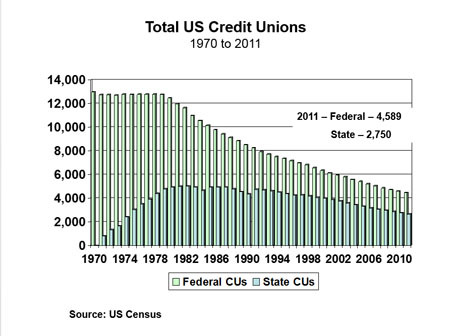 State-chartered credit unions declined from a peak in 1982 of 5,023 to a current low of 2,750 in 2011 (a drop of 2,273). Together, that's a loss of 85,288 board seats (assuming a conservative 8 seats per board) and another 12,793 women director board seats lost (assuming 15%). North Carolina Directors Directors at the top 50 companies in North Carolina have been surveyed by the UNC School of Law over the past 20 years. UNC developed one of the earliest Diversity Databases to encourage selection of more women and minorities for boards. Over that two decade period, total boardmembers at the state's top 50 firms declined by 133 members (from 599 to 466), most of that drop due to the exit of male members (a loss of 163 men boardmembers). Women directors increased from 26 to 56 members, and minorities increased from 11 to 33 over the same period. Small Businesses The Bureau of Labor Statistics reports that the average size of small business enterprises (the engine that drives something like 99% of all job growth in the nation) also demonstrates a decline in establishment size since the turn of the century. 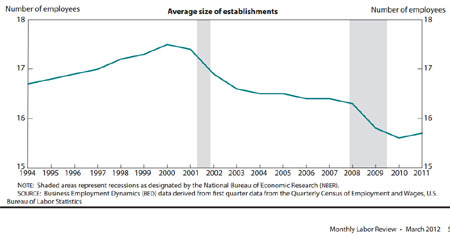 The average number of employees at small businesses has declined from about 17.5 in 2000 to just over 15.5 employees per establishement in 2011. 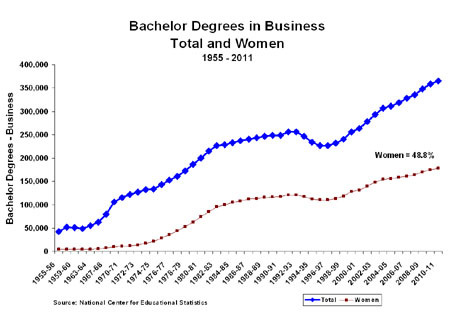 Education of Women Today, women are earning 57.2% of all bachelors degrees and 48.8% of all bachelors degrees in business. 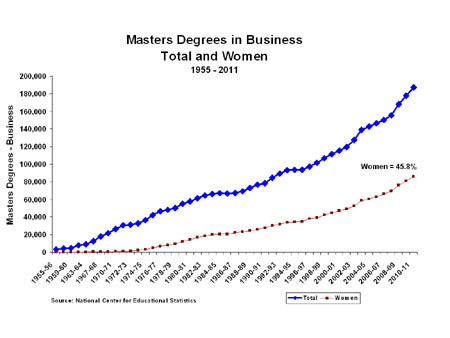 Women are earning 63.4% of all masters degrees and 45.8% of all masters degrees in business. Nevertheless, women are not yet forming larger, profitable corporations that could be building boards of directors and placing women on those boards. Women-Owned Small Business Even though women have been educated almost on a par with men, in business degree programs, there remain stark differences when it comes to small business formation. Women have a much stronger propensity to "go it alone" as a sole proprietor rather than as a firm with employees. Second, when women employer firms DO hire employees, they have a propensity to hire fewer workers than their peers. 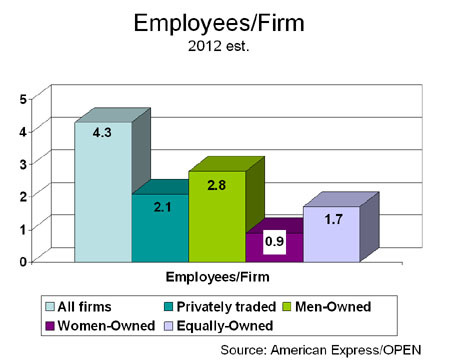 Women-owned firms average less than 1 employee per firm, overall. 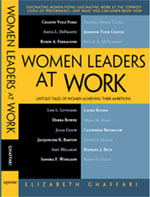 The price women-owned businesses pay for staying small is lower average sales per firm compared to their peers. 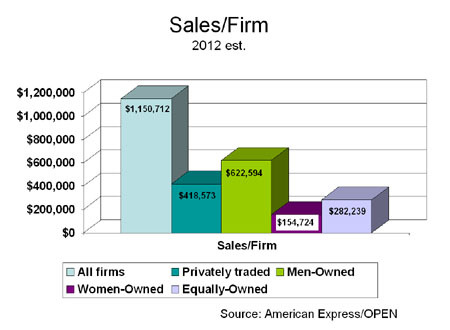 Women-owned businesses tend to start small, averaging barely $155,000 in sales per firm per year. Women owned businesses earning $1 M or more a year have represented 1.8% of the total every year since 1997. These are neither trivial nor unrelated issues. If we want more women on boards of directors, companies (including women-owned businesses) will need to be part of the solution. 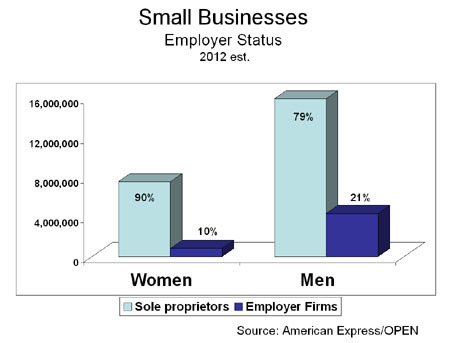 More women-owned firms will have to move from sole proprietorships to employer firms. More women-owned businesses will have to grow their businesses by bringing on employees and a management team. More women-owned businesses will need to be engines of revenue generation. And more women-owned businesses will need to build boards of directors themselves.